I've noticed summer bucket lists on several of my favorite blogs. Little Wonders Days' posted one a month ago and they've already started working their way through the list. Last week they made frozen bananas covered in chocolate. YUM! Creative and Curious Kids linked to my Summer Reading Challenges and Contests post in her bucket list. If I had a list, those challenges would definitely make an appearance somewhere. While we don't have a formal bucket list, we plan on doing several fun things this summer. One activity we plan on accomplishing is writing a few letters to our favorite authors. Letter writing is a bit of a lost art it seems but it's a skill kids should learn. Personal letters are so fun to write and receive! Plus, the activity is a great way to practice spelling and handwriting skills. As far as finding address information, many authors have websites and blogs and sometimes you can find mailing addresses posted online. If you are unable to find mailing contact information for an author, you can also send the letter to the publisher of the book. Just address the letter to the author in care of the publisher. Not all authors will have the time to write back but some will surprise you with a letter in return, especially if you send a SASE along with your letter. 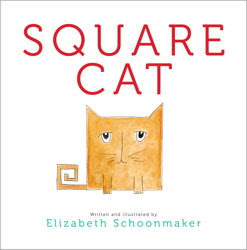 More square cat books are in the works! What kind of adventure or activity would you like to see a square cat tackle? To enter this contest, leave a comment with your suggestion. • Contest ends on Monday, June 20th, 2011 at 11:59 PM CST. Little Wonders Days' family is so excited about their bucket list that they are hosting a weekly Summertime Fun Party link-up on Saturdays. We're linking up this post to the link-up. We would love to see Eula on a world tour to Eiffel tower, big Ben etc and meeting other shape cats.. I'd like to see Eula in the country. Hmmmm........ Square cat could meet a triangle animal. That could be funny. Hmmm. . . I think it would be neat to see the square cat go after a mouse (I'm thinking about round-ish mouse holes here). great idea.. I have my Round Robin coming up this Friday if you want to share this or anything else.. No Princess party it was just part of the Summer Reading program.. Thank you for such a nice blog mention. Bucket list or not, I'm sure you all are going to have a great summer. I've never thought to have Little J write an author, but I think he would enjoy this idea. Thanks for sharing!! I just realized I didn't follow directions correctly. I think it would be fun to see what Square Cat would do if his favorite toy fell into a round hole. How would he get it out?!? I would love for Square Cat to meet some other shapely animals. I would like to see Square Cat go to the County Fair. I would like to see the square cat go to the beach!! Eula is adorable! I think she should visit the pyramids in Egypt. Love YOUR square cat, great job with that. Super cute story book, and I love your daughter's drawing!! I think it would be fun to see how Eula handles a trip to a theme park!! Fitting into the seats for the rides wouldn't be too much of a chore! I would like to see the Square Cat have a Holiday adventure. Sidney loves all the Halloween, Christmas, Valentines Day and other holiday stories. Seeing as I have a round cat who loves sleeping in square boxes, how about a square cat who loves snuggling in ball-shaped boxes? I think Eula should meet some robots who are square like she is. 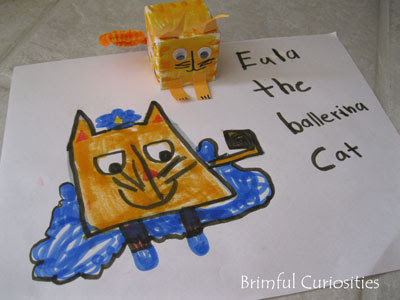 I'd like to see Eula climb a mountain - can a square cat roll down a mountain?? I'd like to see a square cat chase a tiny, round mouse. It's summer. I'd love to see Square Cat at the beach! Square cat exploring the backyard "jungle"
I would love to see Square Cat go to the doctor or take a dance class. Thank you for the lovely giveaway. I'd like to see square cat meet square dog. square cat plays dress up..my daughter favorite thing to do. I'd like to see a square cat tackle some type of sport. I'd like to see Square Cat try out and make a sports team, like soccer. I'd like to see a Square Cat chase a squirrel up a tree. Too funny! Would like to see this cat on a beach. Finding a mouse in a house. So cute and adorable. I would like to see other art works which emphasizes cats. Keep on posting.